With concern, we observe a trend in the current exercise of trophy hunting, which challenges the sustainable “use” of various African species. Here, the greed for profit of some of the hunting providers is disturbing – often also on demand of the hunting guests –to cull record trophy bearers of all huntable wildlife in a very short time here. In this connection, it often occurs that genetically predestined male animals are eliminated prematurely and can thus no longer pass on their strong traits. Thus, a healthy and strong population of the species is endangered in the long term: the weaker animals take over the place of well gifted males and hence pass on their weaker hereditary. On the initiative of the Namibian professional hunter and author Kai-Uwe Denker, experienced African professional hunters developed a catalogue of rules, which is intended to prevent this hunting practice through guiding impulses. Instead of accepting just the size of the trophy as the sole criterion for the entry in the record book, the ERONGO directory for African game demands in the future - this is the name of the work group of experienced African professional hunters as well as of the journal published by them, that is at the same time the official communication organ of the ERONGO MOUNTAIN RHINO SANCTUARY TRUST OF NAMIBIA – to also include ecological and wild biological processes in the determination of the standards. One of the main goals of the ERONGO directory for African game is a healthy, heritage-strong autochthon wildlife population and the preservation of biodiversity in the natural habitats of the hunting areas, as well as migration of the animals on their ancient runways. 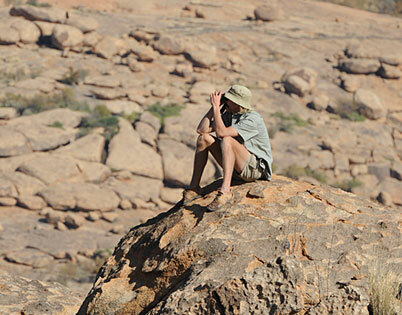 One of the most important requirements for an entry in the ERONGO directory is the age of the trophy. In the future, trophies of animals that are no longer part of the reproductive cycle due to age, are primarily considered in the record book. To compensate for any disadvantages in comparison with a younger trophy, wear and tear of the horns of very old bovids are included via an age factor, especially developed and specified for each species, in order to compensate for any possible losses in respect to the total length. All trophies intended for registration are measured with specially developed measuring instruments by two official experts of the ERONGO directory. A third expert is consulted in cases of disagreement in order to either confirm the correct circumstances or to settle the dispute. 1. The hunting has to take place large scale. The hunted game must have ample opportunity to leave the hunting area, without providing the Hunter with more tracking options. 2. The animals are hunted in their natural habitat, and not as naturalized species. 3. To ensure natural selection in respect to the prey it is required that at least one genus of the large predators is present in the area and can freely trek there. These include leopards, spotted hyenas, brown hyenas, cheetahs and wild dogs. All African countries, in which the designated hunting area meets these requirements, are taken into account in the record book regarding the trophies caught there. 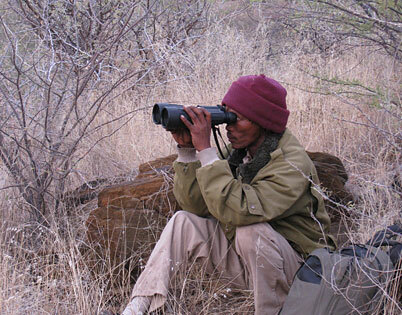 The members of the workgroup of experienced African professional hunters are working tirelessly - partly under personal privations - to substantiate the measurement methods that are stated in the ERONGO directory for African wild game through scientific research projects. 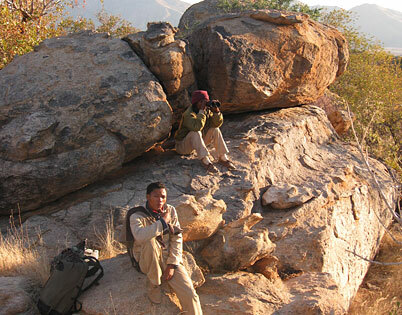 Namibian Government officials, non-governmental organisations, other professional hunters, hunting associations and hunting guests well as the nature protection associations have accepted the principles set in the ERONGO directory and take its ideals and goals as incentive and a standard to continue to support sustainable hunting in Africa. Meanwhile, a new generation of hunting guides has grown up who no longer only see the focus of the hunt in the culling of the animal. Conscious experience of the African landscape with its abundance of incentives as well as its rich fauna and flora plays an equally important role in the mediation of experience. 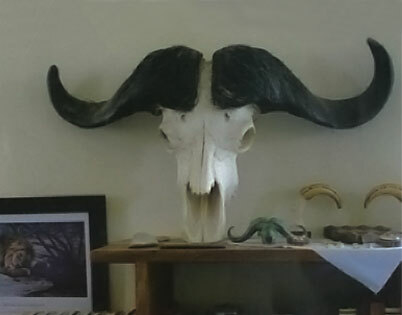 The first international exhibition of trophies of the ERONGO directory took place in September 2012 in Omaruru, Namibia. Various exhibits according to the specifications of the ERONGO directory from Namibia, South Africa, Botswana, Tanzania, Mozambique, Zimbabwe, Zambia, Cameroon and the Central African Republic were exhibited. With the now annual trophy exhibition, the hunters shall be honoured as well, who, with regard to a sustainable hunt, return empty-handed to their homes and instead take back the blazing sunset and the still hunt in heat and dust as unforgettable experiences - and who are still always drawn back due to the spell of Africa. With the pursuit of these ideals and objectives, the ERONGO directory for African game also implements the concerns of the ERONGO MOUNTAIN RHINO SANCTUARY TRUST OF NAMIBIA to prove that nature protection and nature use are not mutually exclusive, particularly through hunting, but are indeed two sides of the same coin.